Norwegian Cruise Line’s 14 ships are floating resorts, known for their innovative freestyle dining and a multitude of eateries (Chinese noodle bar, a Brazilian steakhouse, and Japanese hibachi and sushi), high-quality onboard entertainment, and an abundance of unique recreational options. The newest ships in the Breakaway class (Breakaway, Getaway, and Escape) feature especially fabulous water parks and fun sports options (bungee trampoline, climbing frames, ropes course). In 2014 and 2015, NCL launched the second Breakaway-class and first Breakaway Plus-class ships. The 4,000-passenger Norwegian Getaway offers weekly sailings to the Eastern Caribbean out of Miami. The Norwegian Escape is based year-round in Miami offering seven-night Caribbean cruises. There's an excellent array of family-centered offerings, including supervised children’s clubs for ages 3 to 17 years. 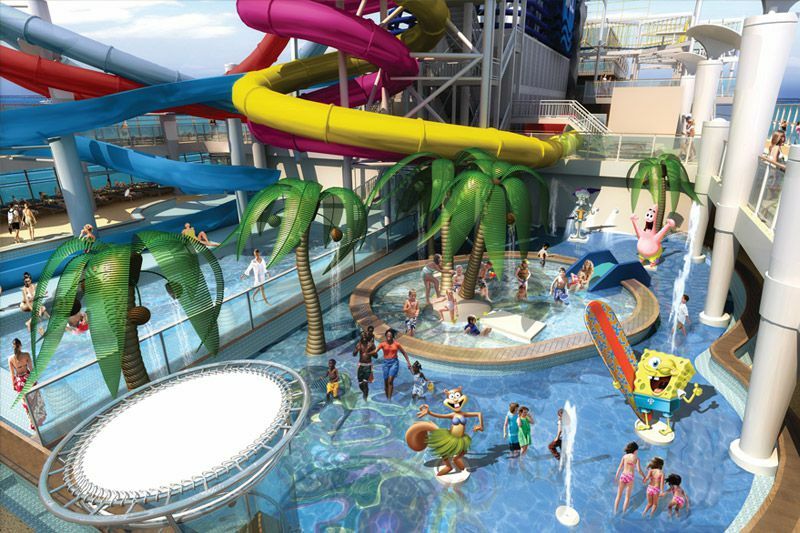 The two-story Splash Academies on Norwegian Escape, Breakaway, and Getaway are NCL's largest children's spaces at sea, brimming with high-tech games, a circus school, and even a small cinema. Splash Academy breaks kids into three age groups: Turtles for ages 3 to 5; Seals for ages 6 to 9; and Dolphins for ages 10 to 12. Programming includes learning to juggle and do other circus tricks, arts and crafts, and Nintendo Wii competitions. For teens ages 13 to 17, Entourage offers sports, movie nights, and a hip clubhouse packed with foosball, air hockey, Wii and other games. Infants and toddlers ages 6 to 35 months can participate in the Guppies activity program, but they must be accompanied by a parent. There is supervised group childcare available during limited hours, but no private in-room babysitting. Were your kids hoping to take part in one of the onboard Nickelodeon or Nick Jr. experiences? Unfortunately, NCL's collaboration with Nickelodeon to provide Nick-themed entertainment aboard select ships ended in late 2015. The Breakaway-class ships are shiny and beautiful, with a more subdued, sophisticated color palette than NCL’s other ships. Highlights for families include: the multi-story AquaPark with multiple slides, pools and hot tubs; sports complex with the largest ropes course at sea, mini golf, rock climbing, and more; more than two dozen dining options (most at an extra cost, however); The Waterfront, an oceanfront promenade with shops and eateries; a large number of family and connecting stateroom options. The newer ships get more attention, but Norwegian’s older ships offer many of the same features at substantially lower prices. They can be an ideal choice for first-time cruisers. NCL can be an aggressive discounter, and past promos have included $99 children’s fares, complimentary onboard credit, and rock-bottom (as low as $25-a-night) fares. If you are flexible with dates, last-minute sailings (within two to three months of booking) can be a terrific score. There’s more onboard nickel and diming on NCL than on some other cruise lines. While several dining rooms and buffets are complimentary, you have to pay extra to take advantage of the dozens of tempting dining options for which the line is known. On the other hand, the wide variety of dining options and flexible scheduling is ideal for families who don't want to be beholden to strict dining times and venues. While some entertainment options are kid-friendly (Blue Man Group), others are decidedly more grown-up and edgy (cue risqué Broadway show, “Rock of Ages”). Norwegian introduced a new ship in the Breakaway Plus class called Norwegian Bliss in early 2018. Is Disney Cruise Line a Good Fit For Your Family? Which Cruise Line Is the Best Fit for Your Family? Is MSC Cruises a Good Fit for Your Family? Is Royal Caribbean a Good Fit for Your Family?